The progress looks great. 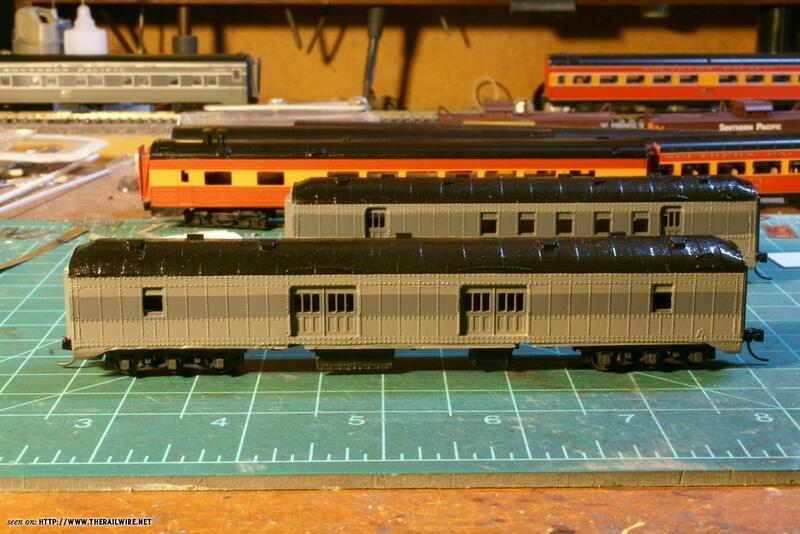 I have built my own N Scale 1956 Lark - including one 3 car articulated Lark Club cars, with another set still incomplete. 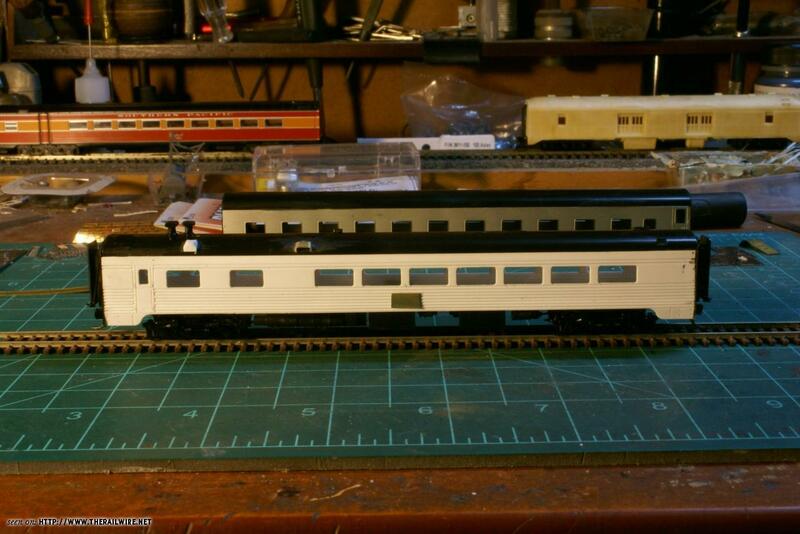 This was before the Kato Daylight was produced - I would be interested to hear how the conversion goes, as this would spur me to complete my consist. It was the Lark that got me interested in railroad modeling over 12 years ago - when I visited the very sad, and nigh on derelict, cars in the Golden Gate Museum south of San Francisco before it was closed and the cars dispersed. I was escorted around the Club car - avoiding the parts of the floor that had collapsed. I am unsure what happened to the articulated cars - any news? Got a little work done on my Lark. Frame and roof have been shortened. Under frame detail has been added. Trucks assembled. Next -- adding the roof detail. Carl Sowell, badlandnp, RBrodzinsky and 2 others like this. Making progress on the Lark. badlandnp, rpeck, luigi-55 and 4 others like this. Wolfgang, is this being built purely with core-kits? Other than the articulated chair and observation -- sure is. 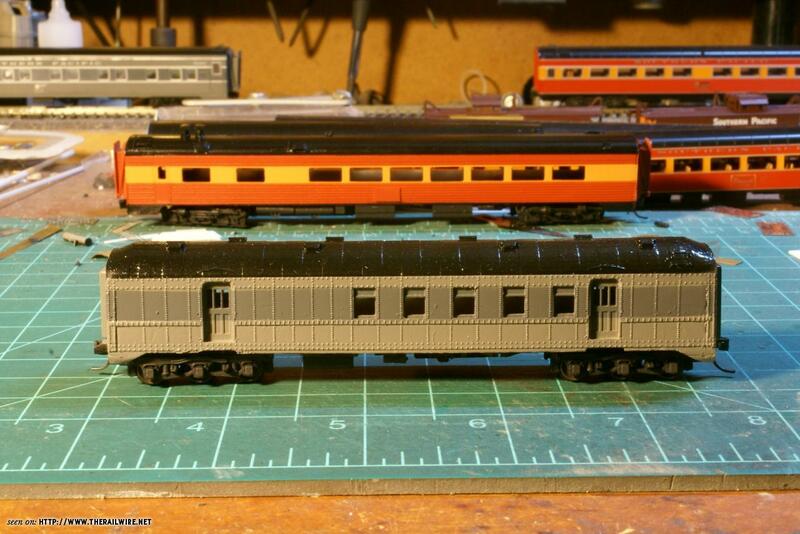 I was going to use the Kato articulated diner for the Lark Club, but, I have decided to go core kits for it as well. There are too many detail differences for the under body and roof details. fordy744, badlandnp and r_i_straw like this. I have a few of the factory decorated Larks from Centralia Car Shops. I see several of your cars are painted in the Sunset scheme... I thought all Larks were two-toned grey. The car in the upper left is a Centralia car (I have two of them) -- wrong paint -- too many silver stripes(These should be lettering gray. As should the lettering)), silver around the windows and the dark gray stripe was carried through the loading door (On the 13 double bedrooms - the doors where light gray). I'll fix most of the issues -- just not sure how, yet. Disassembly and repaint - ?? Not sure it would be worth the effort. Not sure what you mean by Sunset scheme (The Sunset scheme was a silver car body with red letter board). The other cars are in the Daylight scheme. 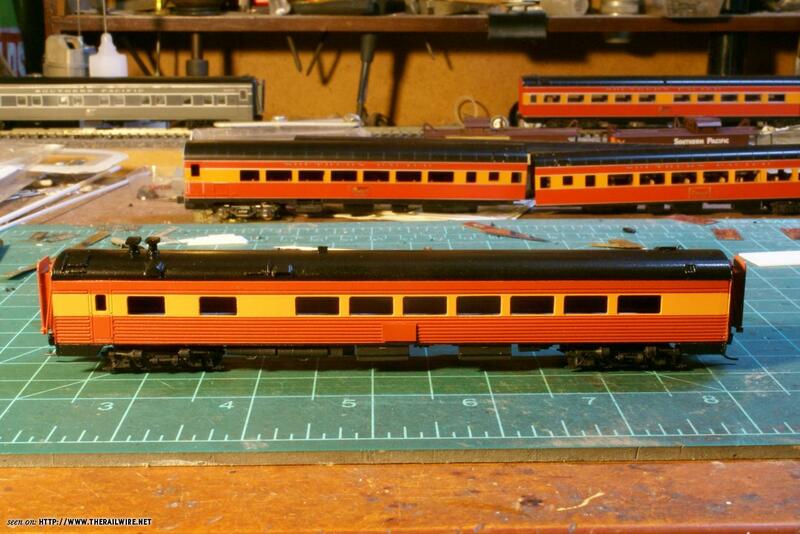 The two cars just behind the head end cars will be painted into two tone gray ( I have a bit more prep work to do). The car in the upper right is not going to be used. It is the triple diner that was going to be the core for the Lark club. I have to figure out how and where to store the darn thing. I may have to separate the cars and store it that way. The 70-D-11 Coffee shop (Snack lounge) is the only car left in its original Daylight paint. At least for the 1956 train. The Lark started to get colorful from 1956 onward. Wolf, incredible modeling, and the official name of the red stripe cars was "Sunset"
He said - "I see several of your cars are painted in the Sunset scheme". That is why I replied: "Not sure what you mean by Sunset scheme". Also in my reply to him: (The Sunset scheme was a silver car body with red letter board). And, to add further complications, the "Sunset Scheme" was later simplified and called the "General Service" or GS scheme by eliminating the thin black striping bordering the scarlet stripe. Many smooth side cars received the GS scheme before the end. They were not stainless steel cars so were painted silver. A model showing the Sunset scheme. A prototype car in the simplified GS scheme. badlandnp and SP-Wolf like this. Yep... I always confuse myself thinking the orange/red colors are based on the color of a sunset... when in fact it is 'Morning Daylight' scheme. Oddly enough... the silver/orange striped cars do not provoke the thought of a sunset... so 'general service' seems more appropriate. The Lark schemes I had seen from another manufacturer (Wheels of Time) seemed too bland looking... but probably are more correct then. The few Centralia Lark cars I got have a 'nicer looking' paint scheme... but obviously nicer is not accurate. Its obvious (of course) that I lack the knowledge about accurate Espee passenger schemes... but I learn new stuff every day. SP-Wolf and r_i_straw like this. Thanks for the info--as said above, I'm learning new stuff from you guys almost every day. So, regarding Lark, I am (slowly) in the process of collecting Centralia cars (10-5, 4-4-2, 13 DBR and observation with maybe a 6-6-4 thrown in) with a view to putting together a pre-1948 Lark with the original paint scheme. Do you know how well Centralia's "as delivered" paint scheme matches up to the prototype? Thanks. Now I'm looking at my Lark consist with an evil eye! Lol You do incredible work, Wolf! I'm at work - so, I don't have access to my books. I have not studied the earlier versions of the Lark. I will check into your question this weekend and let you know my findings. Do you know what version of the Lark ? (At times the trains consist changed.) Or - are you looking to build a generic Lark-? And -- are you looking to build a correct (rivet counter) version of a Lark - ? Wow -- thank you so very much!! Do you know what version of the Lark ? (At times the trains consist changed.) Or - are you looking to build a generic Lark-? We want to see pictures of the finished product.